The late May U.S. Drought Monitor indicates over half of Texas is now under some stage of drought. Ranging from moderate drought (D1) in most of the Texas Coastal Bend, to severe (D3) and exceptional drought (D4) in the Panhandle-South Plains. Often, drought seems scary and ominous. While it is nothing to joke about, understanding drought can help ease some of the concerns of drought. Drought, in the simplest of terms, is a lack of precipitation for an extended period of time. Seasonal droughts are common in some areas and easily predictable. In other areas, drought can creep in unexpectedly and cause many negative impacts. The definition of drought can change from region to region. For instance, in Bali, six days without rain would be considered a drought. Here in Texas though, six days without rain is hardly even a cause for concern! These varying definitions can lead to some confusion; but if you understand your local climate and ecosystem, understanding drought can be easier. Drought can have a number of impacts on a region. Areas with agricultural production may see crop damage and reduced livestock herds due to a lack of rain. Drought can also put stress on groundwater resources used for agricultural and domestic use. Reduced rainfall during drought periods can also lead to health problems, as a result of dust and poor water quality. Throughout history, drought has had a major impact all across the globe. Water is vital to emerging civilizations and contributes to a budding community’s economy. Let us take a look back at how drought has affected humanity in the past. Known today as Central America, Mesoamerica was a historical hub for innovation. The Mayans are known today for their amazing architecture and contributions to mathematics, agriculture, astronomy, writing and art. Classic Maya civilization began to decline in the early 8th century and continued to fail during the next 200 years. Soil studies show that centuries of drought were likely the underlying cause of the collapse. The drought also exacerbated the political conflict, war, and famine that were also major contributors to the collapse. In the midst of the Great Depression, a drought struck the Great Plains in 1931 and lasted just shy of a decade. Nicknamed the Dust Bowl for the massive dust clouds, the drought caused agriculture decimation, many health problems, and resulted in over 6,000 heat-related deaths. Recently, NASA researchers called the Dust Bowl the worst drought of the last millennium in North America. The effects of the Dust Bowl are still being seen in degraded soil productivity across the Southern Plains. Following a 1950s dry spell, the United States remained relatively drought-free until the late 1980s. It was then that prime corn and soybean country in the Northern Great Plains began suffering from low rainfall. Spreading both east and west, the drought was then blamed for the many heat waves and forest fires that broke out in the summer of 1988. 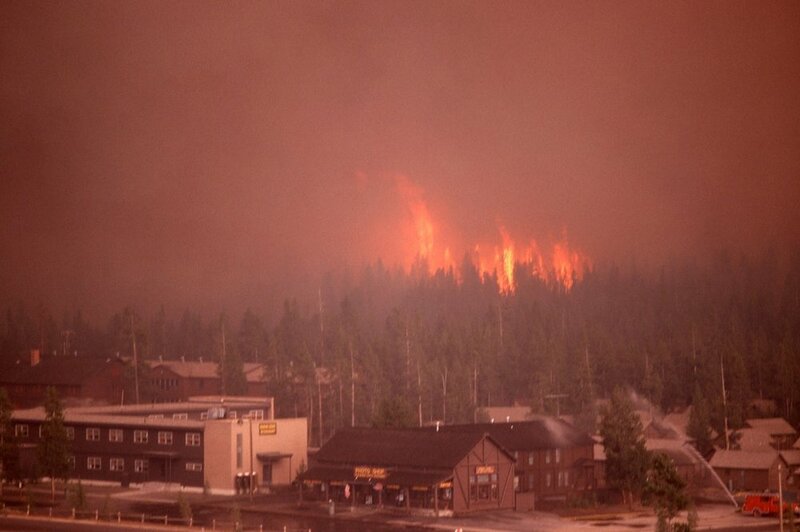 For example, a blaze torched about 1.2 million acres in and around Yellowstone National Park. This forced closure of the park for the first time in its history. Researchers later estimated the cost of this three-year drought at $39 billion, marking it as the most expensive U.S. natural disaster up to that point. Wall of dust rolls over Lubbock, October, 2011; Source: Ben B. Boothe, Sr. In most recent memory, 2011 brought strong drought conditions to the Southern High Plains. The drought was the second worst drought on record in Texas history. Lubbock County received just 5 inches of rain that year, which led to poor crop yields and a great decline of water levels due to the increased need to withdraw water from the Ogallala Aquifer. High Plains Water District reported a decline of -1.95 feet in Lubbock County and a District-wide decline of -2.56 feet. If you live in an area that is in a drought, it is important to do your part in conserving water. During droughts, be sure to consult state and local restrictions on water use. Local and state emergency management contact information can be located at www.ready.gov/today. Here are some other tips you can use to cut back on water use during droughts! Use buckets to catch excess water from faucets. This water can be used to water indoor plants or your garden. Conduct an irrigation audit to make sure your system is operating properly. Ensure that your irrigation is scheduled in either early morning or late evening to reduce evaporation losses. Short showers use less water than filling a bathtub. The average bathtub requires 36 gallons to fill, while average showers use from 2 to 5 gallons per minute. Reduce your water use by turning the water on only to get wet and while rinsing. Operate dish washers and washing machines with full loads. Use a commercial car wash that recycles water. All of these tips are excellent ways to conserve water during a drought or on a daily basis. Taking preventive measures can help ensure that water resources are available and ready to supply the needs of the community during future droughts. More information on water saving technologies and practices is available at www.ready.gov/drought.